While some may associate CO2 pollution mainly with industrial plants and giant chimneys releasing the gas into the atmosphere, the reality is that emissions from the transport sector represent about 24 percent of global CO2 emissions and have the highest emissions growth of all. They are also harder to limit and capture. While there are existing technologies for trapping CO2 out of a smoke stack, for example, there haven’t been solutions for capturing the amount already released into the atmosphere (by cars, trucks, and planes) — CO2 that is 300 times less concentrated than the type coming out of a smoke stack. That is until now. In the beginning of this year, in Squamish, British Columbia, the privately owned (and backed by Bill Gates) company Carbon Engineering began the construction of the first air-capture CO2 demo plant. For years, the company has been developing the technology that is now ready to be implemented on a larger scale. Like trees, air-capture technology traps CO2 from the ambient air. However, as the team at Carbon Engineering points out, “planting enough trees in the numbers needed would require diverting vast amounts of agriculturally productive land. In fact, to absorb enough CO2 as an air-capture facility, trees would require roughly a thousand times more land.” Unlike trees, however, air-capture plants can be built on land that cannot be cultivated, such as deserts. David Keith, a professor at Harvard University School of Engineering and the executive chairman of Carbon Engineering, together with a team of scientists has been doing CO2 capturing at a Prototype Contactor at the University of Calgary for several years already. The prototype system built at the University can absorb emissions from about 14-15 vehicles or about 100 kilos of carbon dioxide per day. 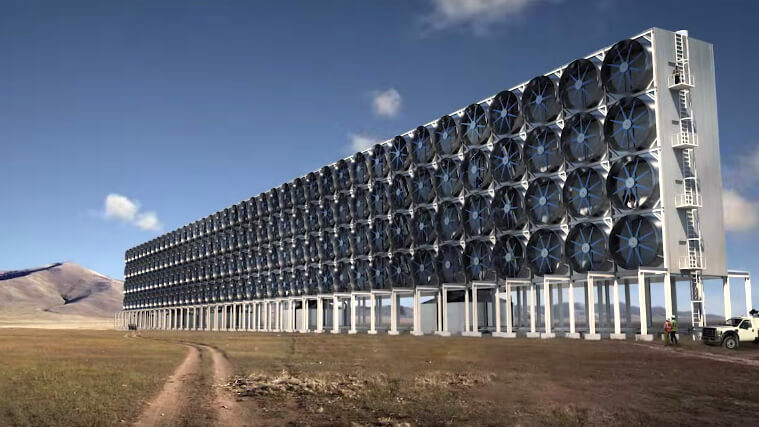 Simplistically put, the way the system works is this — after the air enters into the facility, it passes through a CO2-absorbent liquid that traps about 80 percent of the carbon dioxide into a solution for further processing. In the full-scale facility that is currently being built in Squamish, the CO2 will be recovered from the carbonate solution and integrated into the production of liquid hydrocarbons that are fully compatible with today’s transport infrastructure, but have a low (or even zero) carbon intensity. The construction of the demo plant by the end of this year will be the last step for CE before building a first-its-a-kind commercial air-capture plant by 2017 aiming to close the CO2 cycle.